Dry Wheel Package! Part-Circle Specific Boom! Why use more Boom than necessary. With Part-Circle Rotators spraying 180° behind the tower a 10’ offset is all you need. 11.5’ of 17 gauge galvanized tube means a full 10’ of offset. Are you using Nelson’s R3000 Rotator with the Up-Top White plate for corn and you want Dry Wheel Tracks? We have a Boomback for that! The Corn Boom by IACO! 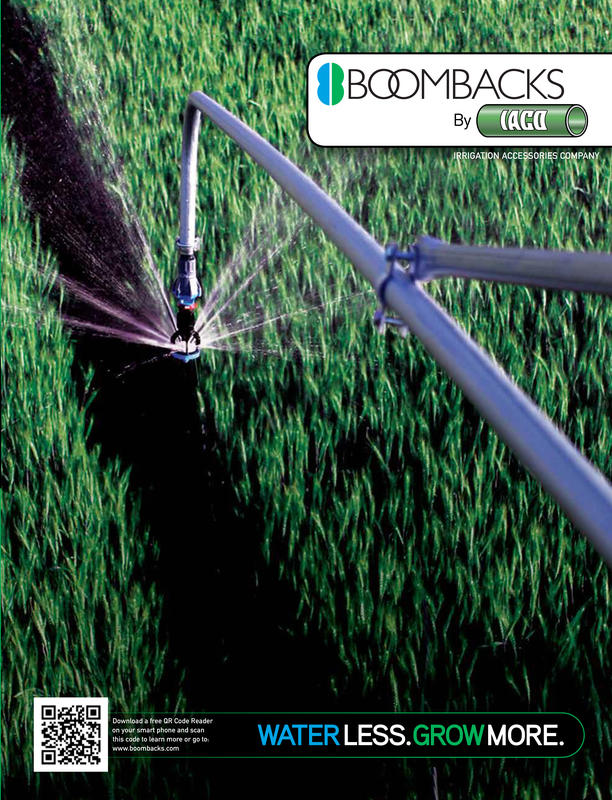 Utilizing the same technology as the industry leading Hose Boom, the Corn Boom uses an upward angle to keep the sprinkler above the canopy. One Boom Does It All! Whether you are using a tried and true sprinkler, even ones requiring a length of hose, or the latest technology in Part-Circle sprinklers, the Hose Boom takes it in stride. Add a length of hose or pull it up close to absorb side force, the Hose Boom has built in dampening. Utilizing the same technology as the Hose boom, the Rigid Hose Drop allows you to use a Nelson Part-Circle Rotator on a Poly-Lined machine. You have the option of putting the drop any place you desire. Simply use a longer or shorter supply hose. The unique drop angle and mounting bracket allows for a level sprinkler anywhere on the span. The Sling Finger is a stand-alone Boom that allows for the attachment of a Hose Sling at the towers  replicating the spread of the truss rod at mid-span. The length of the Boom is 75 from the center of the pipe with a 48 brace for stability. Constructed of 1” O.D. x .049 wall (18 gauge) G-90 galvanized ASDTM-513 ERW steel tubing. Available in 10’, 12’ of 15’. Over 25 years of field proven performance. Improved bracing is 1” x 79” 18 gauge galvanized steel. Constructed of 1 O.D. x .049 wall (18 gauge) G-90 galvanized ASDTM-513 ERW steel tubing. Available in 10, 12 of 15. Over 25 years of field proven performance. Constructed of 1” O.D. x .058 wall drawn type II aluminum 6063-T832. Available in 10’, 12’ of 15’. Over 25 years of field proven performance. Improved bracing is 1” x 79” 18 gauge galvanized steel. Constructed of 1 O.D. x .058 wall drawn type II aluminum 6063-T832. Available in 10, 12 of 15. Over 25 years of field proven performance. Improved bracing is 1 x 79 18 gauge galvanized steel. Our least expensive but still very effective Boom. We have a new angle and improved bracing to meet the demands of growing corn.